Last Sunday, I was invited to Brunch at UNA. The UNA Summer Series Sunday Brunch features a good range of Spanish food and tapas. 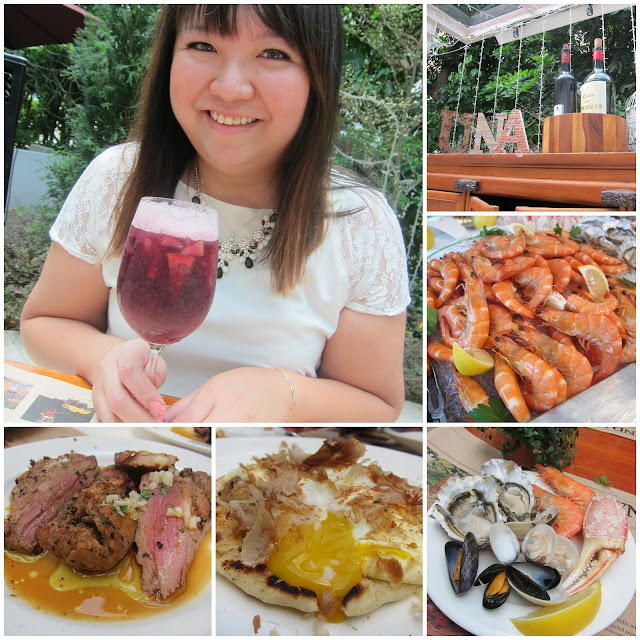 It was a really lovely brunch to wrap up the June holidays and to prepare for Term 3. There was even a BBQ area! Of cos, I did not have to do the cooking! Such a nice laid back setting. There's also an air-conditioned area. There was even an area for private dining upstairs..
Oysters that I really loved! Succulent prawns which I really enjoyed! More photos of the lovely spread! I'm salivating dreaming of the oysters..
Croquetta, both asparagus and crab ones! Some dishes were available at the buffet line while some others could be ordered via the staff so that they're prepared fresh! Scrambled eggs that were fluffy! Check out the oozing yolk! This Pluma Iberica (pork) was about the best I have eaten in a while.. tender and succulent with all the right seasoning. I'm salivating as I write this post! I do wish that the dessert selection was better.. but the other food made up for it..